When thinking about adopting a pet, most people focus on traditional animals like cats and dogs. However, for many people an exotic pet is the preferred choice, and these creatures are becoming increasingly more popular in the United States. According to the American Pet Products Association, 19.4 million Americans had exotic pets in 2013. That’s one in 10 U.S. homes. Exotic pets are rare or unusual animals kept within a human household that are generally thought of as wild species not typically kept as pets. Exotic pet ownership is vast and diverse. Common exotic pets include birds, reptiles, rodents, and snakes, and many of them can be found in commercial pet stores. I wanted to know why someone would want to have an exotic pet. I spoke with past and current exotic pet lovers, and I was surprised by the noticeable love and passion the people I met had for their animals. 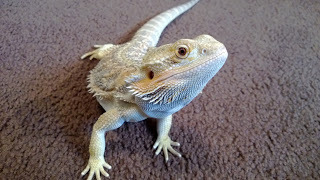 The most common exotic pet I came across was the bearded dragon. Their humans described them as fun and playful, with distinct personalities. All the people I met who had adopted bearded dragons were passionate about their pet’s fun and playful ways. One bearded dragon lover showed me a YouTube video of a bearded dragon playing with a Chihuahua , one of thousands on the site featuring bearded dragons dancing, playing with other animals and with their humans, and generally just being cute. One of the most misunderstood points about exotics, and specifically bearded dragons, is that not all of them belong in a cage. Bearded dragons, for example, enjoy interacting with their owners. They can be taken out of their enclosures (with supervision) to explore their home, and both humans and reptiles find this rewarding. I still couldn’t understand why someone would choose reptiles as pets until the veterinarian I spoke with introduced me to a couple of snake lovers. The first woman I was introduced to explained that she owns a snake because a more traditional pet would be difficult to care for with her irregular work schedule as a nurse. She thought that compared with other more traditional animals, caring for a snake would suit her lifestyle better. Her snake “Rocky” only needs to eat every 2 or 3 days, and he didn’t mind if she worked various shifts. I also spoke with a mom of a 9-year-boy who had become fearful of snakes after watching a movie several years ago. She decided the best way to help him overcome his fear and give him the opportunity to learn about and overcome his phobia was to adopt a snake. Her son apparently conquered his fear relatively quickly, and the snake now sleeps (in his tank) in her son’s bedroom. I didn’t realize until I started asking people “why an exotic pet?” that large birds were considered in this category. I was in a pet store and started a conversation with a gentleman who was looking at birds when he mentioned the most interesting pet he ever had was an African Grey parrot named Louise. He explained that his exotic bird was interesting for a variety of reasons, but he really enjoyed “talking” with Louise. He chose to adopt a bird over a more traditional pet because of his severe allergy to fur—an excellent option many pet lovers with similar concerns might not have considered. Although exotic animals can make wonderful pets, a vet I spoke with near Williamsburg, VA, who has specialty training in exotic animal care asked people to consider the following before adopting an exotic animal. • Not all exotic pets are harmless. Animals such as chimpanzees, pythons, big cats, and crocodiles can be dangerous and do not belong in domestic environments. To protect people, many exotic animals have been deemed illegal to be kept as pets. It is not the responsibility of the individual and/or business providing you with the exotic pet to verify it is legal, but yours. • Make sure you can provide the right home for your exotic pet. This includes but is not limited to housing, food, vet care, and the pet’s overall cost. Many exotic animals have special dietary needs. These can range from the simple, like feeding a lizard insects, to the more complex (and demanding on humans), like feeding a snake live rodents. Reptiles, for example, have very specific needs in terms of lighting, temperature, housing, and space. • Before you bring home an exotic pet, find appropriate veterinary services nearby. Specialty training is needed for a veterinarian to be certified to treat exotic animals. For example, ferrets (which are illegal to own in Washington, DC) are prone to adrenal disease, which requires special veterinary care. If traveling some distance for specialist care is something you’re unwilling to do, please reconsider your decision to adopt an exotic animal. The decision to adopt an exotic pet is a unique one, and for many people it’s the right choice. Exotic animals can certainly give pet lovers the same benefits and joys as traditional ones like cats and dogs. One of the advantages of living with an exotic pet versus a traditional one is the opportunity to learn about an unusual species. However, adopting a pet (of any kind) is a responsibility that should not be taken lightly. It’s important before you adopt an exotic pet to do your research. With this in mind, please check out these resources. And here’s to many years of happiness for you and your pet. Liz is a lover of all animals, particularly the furry ones she volunteers with at King Street Cats in Alexandria. When not volunteering at KSC, Liz can be found teaching indoor cycling. She thanks Steph Selice of KSC for her help with this article.